In February 1918 the Ministry of Information established the British War Memorials Committee. Using the work of the Art Scheme, in which artists had recorded the events of the First World War, they decided to build a Hall of Remembrance dedicated to ‘fighting subjects, home subjects and the war at sea and in the air’, to house the work of several artists. For the central piece they commissioned the artist John Singer Sargent. John Singer Sargent (1856 – 1925) was one of the most established and sought-after society portraitists of his time. He gained his reputation by painting more than the physical resemblance of his subjects, stripping back his compositions to convey a greater, sometimes scandalous, truth. By the time he was commissioned by the British War Memorials Committee he had mainly, despite the demand, retired from portraiture and turned his attention to landscapes. In 1918 he left for France as an official war artist. To commission an artist with Sargent’s reputation can perhaps be seen as a way of honouring the ordinary men who fought in the war. The artist to the elite was depicting the masses on the front line, in keeping with the ‘united Britain’ theme of the recruitment posters. Sargent was American, despite having been born in Italy and spending much of his life in Europe. It is possible that selecting commissioning him was a symbolic salute to the British and American alliance. 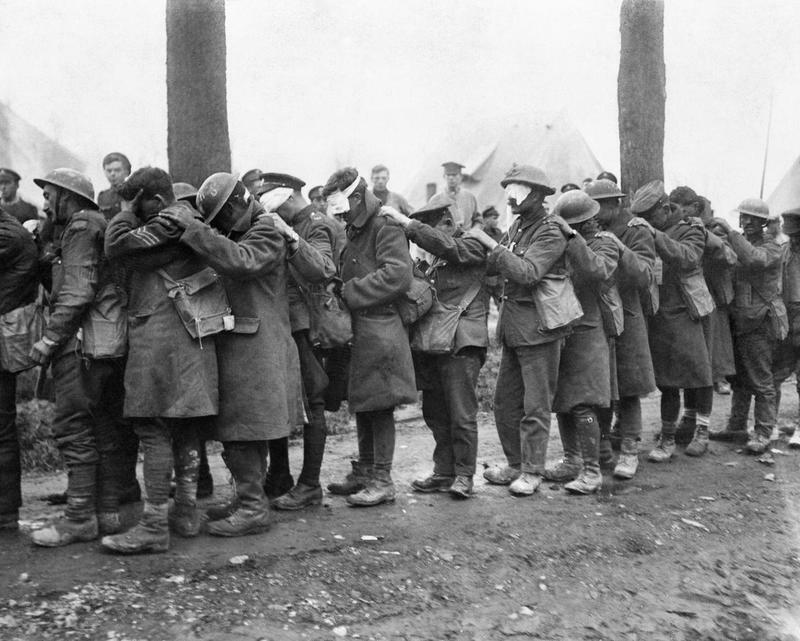 Gassed became one of the most famous and poignant images to be produced during the First World War. The work he produced following this encounter became Gassed, one of the most famous and poignant images to be produced during the First World War. Gassed depicts a group of blinded soldiers, some still with their packs and guns, being led by an orderly to a dressing station. Other victims lie on the ground and in the distance another group of casualties can be seen. The overall result is a landscape of broken and bandaged bodies through which the wounded march. The striking resemblance to Reformation depictions of hell and redemption must have been evident to many who saw the painting when first exhibited. However, what really emphasizes the horror of war is the depiction of a football match being played in the background. The scale and destruction of mustard gas attacks is shocking only to the viewer of the painting, for the soldiers on the front line it is too mundane to warrant an interruption to their game. The use of mustard gas and other poison gases added an effective new terror to warfare, and was widely used despite violating both the 1899 Hague Declaration Concerning Asphyxiating Gases and article 23 of the 1907 Hague Convention on Land Warfare. It estimated that 30 percent of the all casualties in the First World War were the result of chemical warfare, and of this 80 percent were the result of mustard gas attacks. If treated, the mortality rate of mustard gas attacks was approximately five percent but the lasting effects of burns, respiratory problems and blindness could be devastating. For those welcoming home its victims this new type of weapon must have been incomprehensible; a catalyst for reflection on the nature of warfare in an advancing world. Read more about the development of chemical weapons here. I wish those people who write so glibly about this being a holy war, and the orators who talk so much about going on no matter how long the war lasts and what it may mean, could see a case […] could see the poor things all burnt and blistered all over with great suppurating blisters, with blind eyes - sometimes temporarily, sometimes permanently - all sticky and stuck together, and always fighting for breath, their voices a whisper, saying their throats are closing and they know they are going to choke. Vera Brittain, nurse. Sargent’s choice of subject matter makes for a surprisingly stark tribute of remembrance to the war. Where one expects to find a rousing tribute to the glorious dead, Sargent created a platform that fixed the newly experienced horrors of modern, industrialised war into the public consciousness. ‘Gassed’ is a poignant symbol of the end of one era and the start of a new; the great society portraitist’s final comment on the world he spent his career recording. « The Devil’s Business or the Armourer’s Faith?